Photo Cutline: Students from the TRIO UB, UB GOST and TS programs are provided with valuable information about the ACT by a representative from Cambridge Education Services. The TRIO Talent Search (TS) and Upward Bound (UB) programs at the Coastal Bend College (CBC) Beeville location recently hosted an ACT workshop for students in the programs. A representative from Cambridge Educational Services conducted the ACT workshop inside of the Gertrude R. Jones Auditorium for over 70 students. Cambridge Educational Services partners with educators and programs like TS and UB to achieve educational advancement for all students. Cambridge Educational Services goals of the ACT workshop include: building college and career skills, raise test scores, enhance curriculum, and support instruction. Students had the opportunity to answer ACT sample questions and review them with a Cambridge Educational Services Representative. The representative reviewed each question and provided students with real-time feedback and provided students with test taking tips that would translate well for any tests that the students might encounter. The TRIO TS program is designed to identify students from disadvantaged backgrounds who have the academic potential to succeed in higher education and provides them with academic tutoring and advising; information on financial aid programs; assistance in completing financial aid applications; and support for applying for college. CBC Beeville’s TRIO TS program currently serves students at the following high schools: A. C. Jones High School, George West High School, Karnes City High School, Kenedy High School, Mathis High School, Odem High School, Pettus High School, Refugio High School, Runge High School, Skidmore-Tynan High School, Taft High School and Three Rivers High School. Additionally, UB and UB GOST (George West, Odem, Sinton and Taft) are college prep programs that are designed to assist high school students who are from economically disadvantaged backgrounds and/or first generation college students. As a part of a federally funded grant, participating in the UB programs comes at no cost to the student. The TRIO UB program currently serves students in Beeville, Mathis, Pettus and Skidmore-Tynan. In addition, the TRIO UB GOST program currently serves students in George West, Odem, Sinton and Taft. CBC Beeville’s TS, UB and UB GOST programs are filled with academic and enrichment courses, tutoring, educational field trips and volunteer opportunities. TS, UB and UB GOST advisors frequently make visits to each respective student’s high school to provide one-on-one advising services. Prospective students who would like more information about CBC Beeville’s TRIO programs should contact the TRIO TS Office at (361) 354-2706 or the TRIO UB/UB GOST Office at (361) 354-2715. Additional information is also available online at www.coastalbend.edu/trio. Photo cutline: Texas Tech University graduate Guadalupe Encinia of Mathis was named TRiO SSS Achiever of the Year and was presented with a commemorative plaque by CBC TRiO SSS Project Director Jeri Morton. 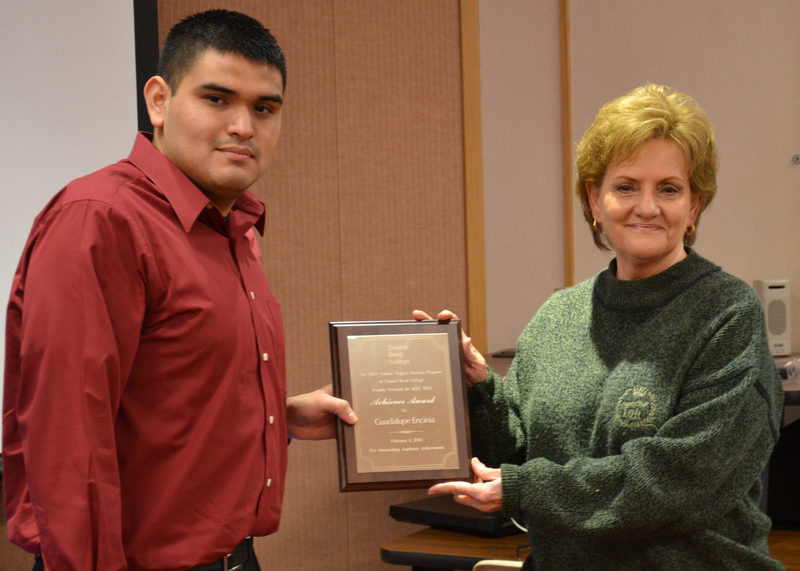 Coastal Bend College TRiO Student Support Services named CBC graduate Guadalupe Encinia of Mathis, TRiO SSS Achiever. Encinia talked about his experiences with CBC students during a reception held to celebrate TRiO Day. Encinia, who recently completed a Bachelor’s Degree in Sociology at Texas Tech University in Lubbock, told a group of CBC students that his involvement with TRiO opened doors for him. “No one in my family went to any kind of college or training school,” he said. His three years in TRiO SSS while at CBC was a great help to his academic career. 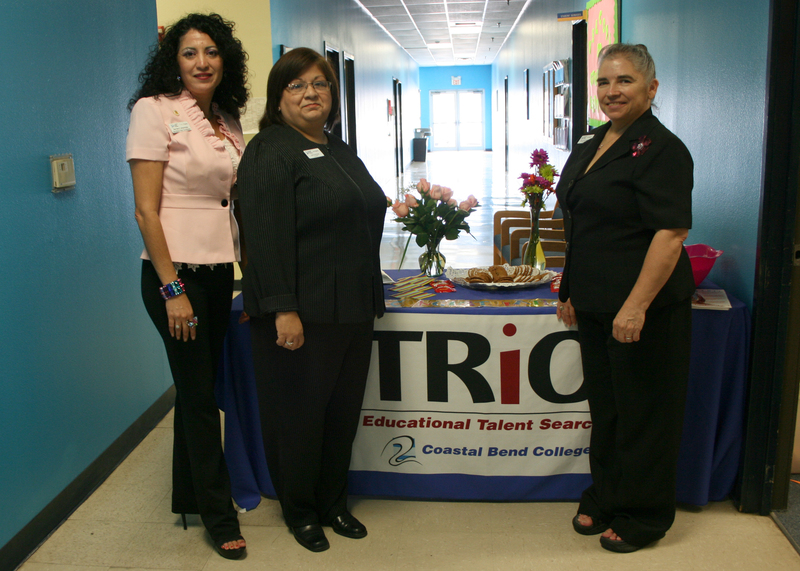 Coastal Bend College will celebrate TRiO Day on Feb. 24 in Beeville. TRiO Day is a nationwide annual celebration that recognizes the value of federally-funded TRiO Programs and the successes of their students. TRiO Programs are educational opportunity outreach programs designed to help students from low-income families where neither parent has graduated from college and/or first generation Americans enter college, graduate and move on to participate more fully in America’s economic and social life. The program also provides information on pre-college opportunities. 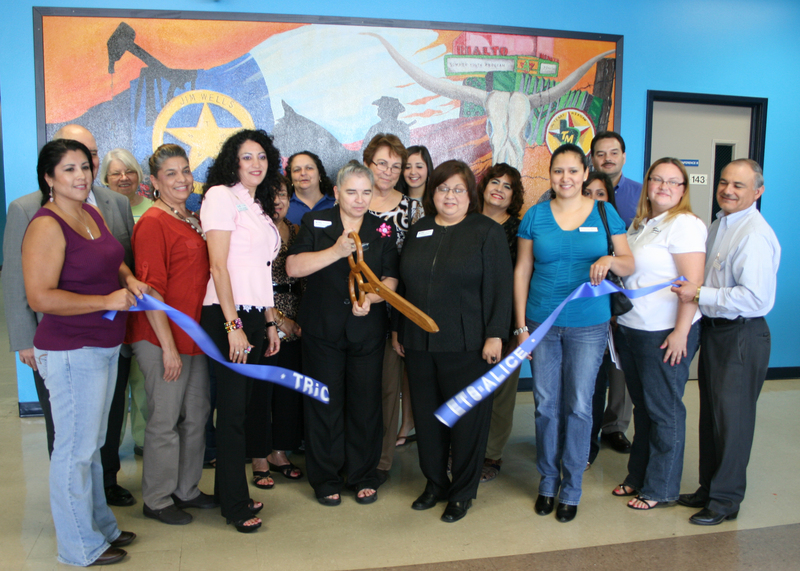 Coastal Bend College – Alice Campus TRiO Educational Talent Search recently held a ribbon cutting ceremony to celebrate a grant award of $230,000 for a five-year extension of the federal program. TRiO Educational Talent Search staff in Alice, from left, are DeeDee Arismendez, students tutor coordinator; Julie Enriques, ETS counselor; and Josie Schuenemann, ETS program director. They work with more than 600 students from schools is Alice, Benavides, Falfurrias, Freer, Orange Grove, Premont and San Diego. The ETS program identifies and assists individuals from disadvantaged backgrounds who have the potential to succeed in higher education. The program provides academic, career, and financial counseling to its participants and encourages them to graduate from high school and continue on to and complete their postsecondary education. The program publicizes the availability of financial aid and assists participants with the postsecondary application process. Talent Search also encourages persons who have not completed education programs at the secondary or postsecondary level to enter or reenter and complete postsecondary education. The goal of Talent Search is to increase the number of youth from disadvantaged backgrounds who complete high school and enroll in and complete their higher education. “We get middle school students to think about their career interests. We get juniors ready for their senior years,” said Josie Schuenemann, TRiO ETS Program Director in Alice. CBC Educational Talent Search Program in Alice serves seven area schools and 616 students. Participating students are from Alice, Benavides, Falfurrias, Freer, Orange Grove, Premont and San Diego High Schools. Schuenemann said she was thrilled with the grant award because of the impact it will have on local participants. “Most of our students are first-generation high school graduates who have never even been to a college campus,” said Schuenemann. “In our first year, we had 80 percent of our students enroll in college. “Last summer, 41 of our students went on campus tours,” Schuenemann said. They visited Coastal Bend College (Beeville), the University of Houston – Victoria, Lone Star College (The Woodlands), and the University of Houston – Downtown. Earlier in the year, students were given the opportunity to visit the University of Texas — Pan American (Edinburg) and the University of Texas at Brownsville. College tours give the participants access to colleges they may be considering and also gives them a glimpse of typical college life. “We appreciate our taxpayers and those who wrote letters in support of this program,” Schuenemann said. In the last year alone, 120 students were assisted with free tutoring during about 378 sessions. The 30- to 120-minute sessions covered TAKS, SAT, ACT, study skills, and subject-specific topics that are customized to address the needs of each student. About 80 TRiO ETS participants shadowed business and civic leaders in the area last year. TRiO ETS relies on volunteers from local governments, healthcare facilities and private companies to help students explore their chosen fields. Many of those volunteers attended the ceremony. TRiO Educational Talent Search, housed at Coastal Bend College – Alice Campus, was funded for an additional five years at $230,000. CBC President Dr. Thomas Baynum attributed the re-funding of the programs to the hard work of the Alice and Beeville staff and to the grant-writing skills of Dean of Student Services Velma Elizalde. TRiO ETS will be funding through the 2016 school year. CBC Beeville TRiO ETS program was also funded for another five years at $306,752. The program in Beeville serves 671 participants in 12 schools in Beeville, George West, Karnes City, Kenedy, Mathis, Odem, Pettus, Refugio, Runge, Skidmore, Taft and Three Rivers.